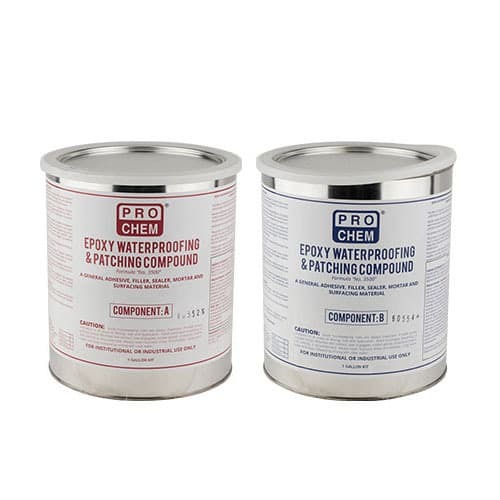 EPOXY WATERPROOFING AND PATCHING COMPOUND | Pro Chem, Inc.
EPOXY WATERPROOFING AND PATCHING COMPOUND is a two-part epoxy system that has multiple uses. It dries to a permanent, water-resistant bond for a complete seal and repair that is actually stronger than the original surface. It is a non-sag gel with excellent adhesion and ease of use as a versatile, general-purpose adhesive mortar that can also be placed on vertical and overhead surfaces. The mortar is easy to work with and will level smoothly. 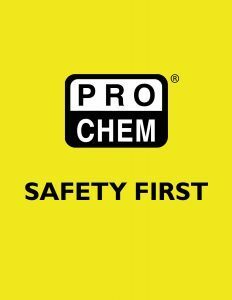 When cured, it is resistant to fresh or salt water, detergent, soil, oils, greases, mild acids or other common industrial chemicals. It can be used on concrete floors, tiles, bolts and rebar. Follow directions for surface preparation. Mix equal volumes of Part A and Part B. Mix thoroughly with a heavy duty, low speed drill fitted with a mixing paddle. Mix until uniform in color. Apply with trowel. Remove excess before curing. Avoid feather edging. Curing time is based on an application temperature of 25°C (77°F). Initial set time is 6 hours. Light traffic in 16 hours (overnight). Full cure in 72 hours. Note: Do not apply when temperature is below 55°F.